It doesn’t matter how old you are, it’s never too early to start thinking about your retirement savings. Interestingly enough, however, your retirement savings don’t need to solely be used for retirement. With the right circumstances and the right IRA, you could actually use your IRA for investment opportunities — if that’s something you’re interested in, of course. The non-recourse lenders at First Western specialize in IRA non-recourse loans, which is to say that we deal with the investment side of retirement accounts. But as you’re considering your future financial goals and plans, it’s a good idea to establish which retirement account makes sense for you and your lifestyle. Learn more about what might be the best retirement savings plan for you, and if you’re interested in using your self-directed IRA for a rental property loan, contact First Western Federal Savings Bank today! A Roth IRA is a much better option for you. With traditional IRAs, your money is taxed upon withdrawing anything from your account. This is because it’s not taxed beforehand, whereas a Roth IRA means you pay taxes on the money before putting it into your account. Some people don’t mind being taxed after the fact (versus before they put it into their account), but if you’d rather be able to use your money right as it is when withdrawing it, a Roth IRA is a good call. A self-directed Roth IRA or self-directed Traditional IRA Solo 401(k) is your best bet. These types of IRAs have a lot more freedom with investment opportunities, such as applying for a rental property loan, investing in stocks, or more. If you’re interested in expanding your financial portfolio with the potential for growth, rather than just savings, an IRA with the right flexibility is right up your alley. Our non-recourse loan lenders have a wealth of knowledge when it comes to utilizing your self-directed IRA for rental property loans — visit our IRA non-recourse loan page to learn more. A traditional IRA is something for you to consider. This is a fairly common IRA for people to enroll in, usually either because it’s offered through their employer or because they’re not comfortable with investing their current funds into bigger financial projects. Additionally, Forbes points out that “A traditional IRA may be a better choice than the Roth if your current tax bracket is higher than you believe it will be in retirement.” Forbes also goes on to explain that moving money from a 401(k) into a Roth IRA could result in owing income taxes on what you transferred. It’s probably in your best interests to enroll in a Roth IRA. Most people plan on working their way through their careers and financial ventures, making more money over time. However, this is not always the case — certain industries or jobs might not have enough financial growth offered to move you up to a different tax bracket. Not to mention, your income could increase each year, but it still might not be enough to move you up to a different tax bracket. That being said, if you’re pretty sure or planning on being in a higher tax bracket by the time you retire versus where you’re at now, it’s a good idea to consider enrolling in a Roth IRA. You’ll be able to save on taxes later. A self-directed Roth IRA or self-directed Traditional IRA has what you’re looking for. For self-directed Roth IRA’s, it’s much easier to withdraw without penalty before you reach the retirement age (59½). Traditional IRAs have their benefits, but they’re not as flexible as Roth IRAs in terms of taxes and tax penalties. With a traditional IRA, you not only would face a 10 percent penalty if you make an earlier withdrawal, but you would also be required to take out money when you turn 70½. Additionally, you cannot continue contributing to a traditional IRA once you’re older than 70½. Hopefully this has helped provide you with some guidance for which IRA would work best for you. Much of the decision-making boils down to your lifestyle, your financial goals, and your current financial situation. 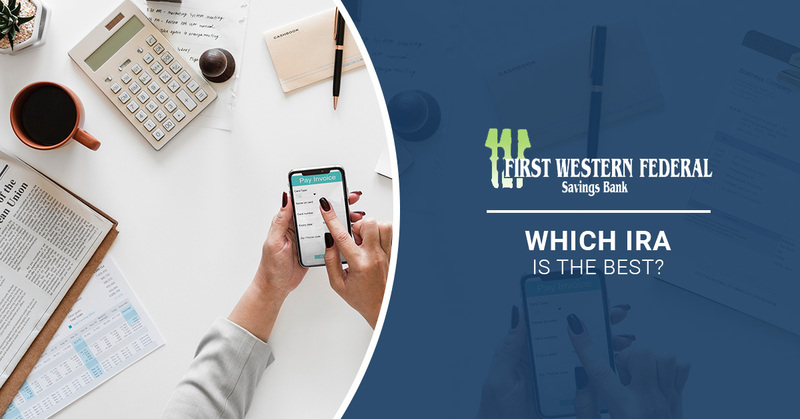 If you are interested in using your self-directed IRA for rental property loans and real estate investment opportunities, First Western Federal Savings Bank is the lender of choice for you to work with. Offering competitive rates and coming to the table with nearly four decades of experience, you’ll be working with one of the nation’s most trusted lenders. Learn more about what your rental property loan could be used for, and apply with First Western Federal Savings Bank today.